A fossil bird recovered from Cretaceous lake deposits in China shows preservation of some soft tissues, including a pair of lungs that appear to have functioned in a way similar to those of living birds. 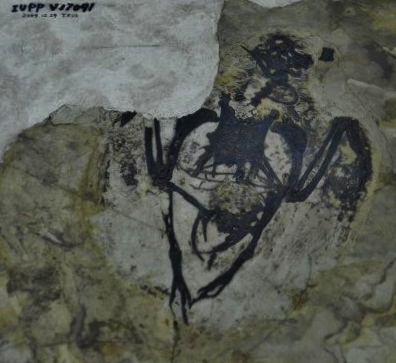 The fossil, named Archaeorhynchus, is part of what is called the Jehol biota, found in Liaoning Province, Northeastern China. Several other species of fossil birds are found in the area, along with a rich diversity of other types of fossils. Several other examples of soft-tissue preservation are known from the Jehol biota. Archaeorhynchus differs from living birds in some skeletal features[i] (e.g., the lower jaw is not strongly forked posteriorly), but is similar to modern birds in many other features. These include unidirectional lungs, a toothless beak, a keeled sternum, the shape of the furcula (“wishbone”), and asymmetrical flight feathers. In addition to the ordinary tail feathers, two extra-long tail feathers extend beyond the rest of the feathers as in some species of hummingbirds. Archaeorhynchus is considered to be a mosaic, that is, possessing a mixture of features of living birds along with some features of extinct types of birds. Two points stand out from this discovery. First, the specially designed lungs in living birds are seen also in fossil birds. Bird lungs do not change in volume during breathing, but air is pumped through the lungs by movements of the body. Air sacs in hollow bones act like bellows to maintain air flow. Fossil birds, as far as is known, have the same respiratory system. Some dinosaurs have also been found with some hollow bones, although it is not clear how bird-like their respiratory system may have been. The specialized, highly efficient respiratory system of birds is crucial to their ability to fly, and is readily interpreted as due to design by an intelligent Creator. The second point concerns the excellent state of preservation of the fossils of the Jehol biota. [ii] In order to be fossilized at all, dead organisms must be buried soon after death. For preservation like that seen in Archaeorhynchus, burial and mineralization must be quite rapid, before scavengers, bacteria or physical processes destroy the carcass. Yet well-preserved fossils of Archaeorhynchus and many other types of animals, several of them with soft-tissue preservation, are found interspersed in sediment supposedly accumulating over more than five million years of time. Is it reasonable to suppose that the special conditions necessary for such rapid preservation of a rich diversity of complete fossils could persist or occur multiple times over such a long period of time? Fossils of fish are also common in these layers, and one would expect them to attack carcasses under ordinary circumstances. A possible alternative scenario is that the fossils accumulated rapidly under specific conditions existing for a short time. If that is the case, both aquatic and terrestrial organisms may have been transported into a basin and preserved after being quickly covered with sediments as part of a catastrophic rather than gradualistic process. Information from fossils such as Archaeorhynchus may be helpful in improving our understanding of the global catastrophe described in Scripture. [i] Zhou, S, Z. Zhou, JK O’Connor. 2013. Anatomy of the basal ornithuromorph bird Archaeorhynchus spathula from the Early Cretaceous of Liaoning, China. Journal of Vertebrate Paleontology 33(1):141-152.